In 2007, Tori announced that she was working with playwright Samuel Adamson on a stage musical for the National Theatre of London. She wrote and composed all the songs and developed the narration and characters in collaboration with Adamson. People had been asking Tori to write a musical for years, but she wanted to wait the good moment to do this. She finally chose to adapt the fairytale of 19th century Scottish writer George MacDonald, "The Light Princess" : the story of a princess whose evil aunt deprived her of all gravity as a punishment for not being invited to her christening. She then flies around and, as the curse also made her "light of spirit," she becomes a mindless teenager who doesn’t really care about other people’s feelings. The only thing able to ground her is the lake from the village, and she develops a passion for swimming. One day, by the lake, she meets a beautiful prince but pays little attention to him. When the evil aunt decides to drain the lake, the prince volunteers to save it by inserting his own body as a plug, meaning he will drown. When he’s almost dead, the princess comes to rescue him and finally realizes the deep feelings he has for her and is able, at long last, to love him. Her love finally anchors her to the world and, as she’s able to walk, she marries the prince. MacDonald’s story was considered as subversive in its time, and, according to Little Blue World, he has a "quirky writing style" and uses "wry witticisms and sly puns." Tori clearly said she wasn’t making a musical for children but would instead tell the story of a girl discovering love and sexuality. The character of the evil aunt was removed from the story to sound less Sleeping Beauty oriented and more actual. The final plot is the following: Princess Althea loses her gravity and the ability to cry at age 6, after her mother’s death. Her father’s country, Lagobel, is at war with neighbouring country Sealand. Lagobel has gold but no water meanwhile Sealand has water but no gold. Althea’s brother is killed at war and her father asks her to be queen, but she refuses. Althea’s father tries to find cures to her loss of gravity but none of them work and when he plans to force her into an arranged marriage so she can provide an heir to the throne, she runs away into the wilderness separating the two countries. The water from the lake she finds there finally grounds her and she meets Digby, Sealand’s prince, who’s unable to smile since his mother’s death. They fall in love and have a child, but they don’t agree about what they want to do: Althea doesn’t want to leave the lake while Digby dreams of a more traditional life. When Digby returns home, he learns his father wants to dam the lake in order to cut off Lagobel’s water supply and kill all the people. Digby breaks down the dam but is nearly killed in the process. Seeing this, Althea at long last cries and regains her gravity. They get married and live happily ever after. As she doesn’t want to be queen, Althea gives the throne to her prime minister and becomes a marine biologist. 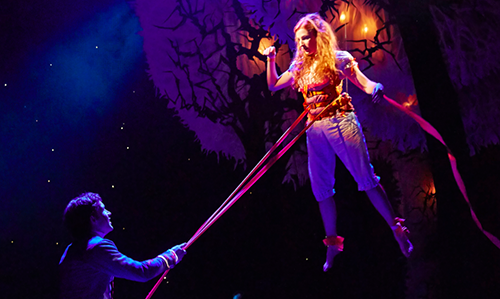 The Light Princess opened at the National Theatre of London in September 2013 under the direction of Marianne Elliott, who was awarded with the Best Play Tony Award in June 2011 for co-directing War Horse in 2010. 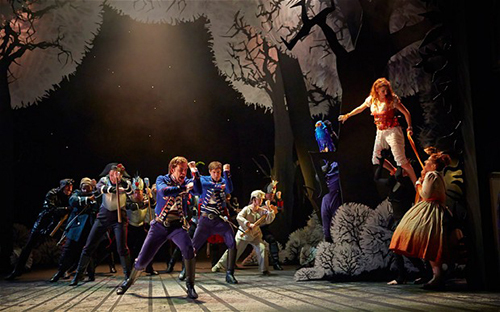 The production ran until January 2014 on the theatre’s stage. Actress Rosalie Craig played the main part, Princess Althea, and won Best Musical Performance at the Evening Standard Theatre Awards 2013. The musical features a wide range of musical styles and influences, whether it’s classical, rock, pop, soul or cabaret songs. Reviews were overall positive, emphasizing Elliott’s direction and Tori’s music.